A recent City Bureau town hall meeting. Image from City Bureau. Bettina Chang: City Bureau’s goal is to develop our strategies and strengths outside traditional media circles, then inject our values and stories into traditional media to eventually effect change on the whole industry. We structure the newsroom in a few ways that differ from others — first, by putting community first. We hold regular events to engage residents in our reporting process, from the point of developing a story idea, to finding sources and refining the narrative, to the final release of the piece. We also encourage collaboration among our reporters — it’s uncommon to find just one byline or contributing reporter on a City Bureau story. Our reporters are at all different levels in terms of skill sets, so they work together and teach each other, whether they’re out filming an interview or formulating a story idea. 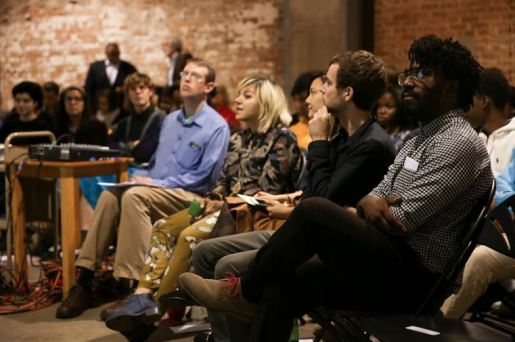 That taste for collaboration exists on an institutional level, too — we love partnering with other civic groups and publications who are open to trying something new and exciting in the community media space. We hope the dynamism of the City Bureau newsroom will not only prepare journalists for their future careers, but energize other media outlets to take a new approach to newsmaking. BC: At the Tribune and Sun Times, revenues are down and both newspapers faced major editorial cutbacks in recent years. We work in communities where overworked/underpaid/under-resourced reporters and publications in traditional media lack a foothold.. So City Bureau was born in part to reinvigorate coverage in these areas. With support from our funders, plus the resources/ relationships we have developed in these areas among other civic groups, we are able to train and provide resources to journalists who live and work on the South and West sides, many of whom are minorities and/or from low income backgrounds. These journalists bring invaluable expertise and perspective that ensure fair, balanced and in-depth coverage of the important issues facing marginalized communities in Chicago — plus they have a fuller understanding of the vibrancy and diversity of experience in these neighborhoods than a reporter who might visit once or twice a month. Andrea Hart: We want to amplify and integrate these voices into the city’s narrative in the hopes of deconstructing problematic narratives imposed on the city’s South and West sides. It should come as no surprise that there are young folks in these neighborhoods who are incredibly capable of telling stories about police misconduct that are layered and living. They have a right to access media production just as they have the right to access beneficial educational resources. City Bureau is creating a space where that access is combined. For various reasons traditional outlets fail to accurately represent these communities — in part because they are caught in longstanding stereotypical narratives and also because of limited capacity. Unless they are actively working against it, newsrooms can be complicit in historically discriminatory policies. Just as we are seeing a need for cultural sensitivity training amongst Chicago police, this is something that could also be useful in media outlets. AH: Our training approach is rooted in the foundations of journalism as well as the context of our location. The goal is to not only help students develop skills but to also get an understanding of hyperlocal civics. And in that regard it’s not just the students learning–everyone at every level is participating in an exchange of knowledge. Whether it’s better understanding these communities or better understanding how to use Final Cut X — it all matters. Having students understand they are working within a network of resources both human and not is also a way to expand their social capital. Two of us have gone through Medill (Bettina and Andrea) at a time when there was fear and uncertainty around tools like Twitter, blogs, etc. Instead of being apprehensive about new technology, we think a critical openness and willingness to experiment are essential to training. Also, if you are going to try to get into more “social justice” (however you define that) journalism it’s important to understand what assumptions you are carrying or who you are attempting to speak for that might already be able to speak for herself. DH: The program works by bringing journalists of different ages and skill levels together to work in teams that help guide and teach each other. City Bureau is set up in a 3-track structure that includes high school-aged mediamakers, college-aged reporters and early career/independent reporters — all of which have opportunities to learn from each other throughout each cycle. By putting these reporters in teams led by our early career journalists, experience and knowledge is shared freely across the pipeline. Our founding group leads the newsroom and curriculum, where our reporters are assigned research reports and story assignments, learn journalism 101 skills (from man-on-the-street interviews to the art of FOIA) and attend educational workshops led by other working journalists. For our pilot cycle, we’re reporting around the Citizens Police Data Project, a new interactive database of more than 56,000 Chicago police misconduct complaints. Future cycles will tackle similar issues that are of utmost importance to the city as a whole, and the South and West sides of Chicago in particular. The final portion of our work uses our in-house editing process and connections in the media industry to direct City Bureau’s publication-ready stories to larger outlets in Chicago and around the country — stories we’ve published in the Chicago Reader, The Chicago Reporter, DNAinfo Chicago and The Guardian are some of our earliest examples. This serves several purposes: bylines for our reporters to show how their work can have immediate and powerful effects on public discourse; support for young journalists that may one day soon intern and/or work at such publications as well as the creation and distribution of high-quality content directly informed by marginalized communities in Chicago. HB: The first few months have been a pilot project supported, in part, through funding from Illinois Humanities as part of their Reporting Back program. We also just received a planning grant of $25,000 from the McCormick Foundation, which we expect to put towards new start-up costs and some improvements to the newsroom, and we’re starting the conversation about funding with other foundations as well. BC: As a group, we’re incredibly cognizant of the challenges facing local journalists. Each one of us has worked in a different capacity for different local outlets — from indie media, to nonprofit media to traditional newspapers. One challenge for local outlets is the ability to develop talent in racially and socioeconomically diverse populations. It’s very hard to be a journalist now without a college degree or a few unpaid internships under your belt. Another major challenge is that local residents rarely see fit to pay for good local journalism. Decades of advertiser-supported journalism have conditioned people into thinking that journalism is free or cheap. Now that the quality of reporting has fallen, especially in disenfranchised neighborhoods, people are starting to take note and demand better. Meg Dalton (@megdalts) is the associate editor of Mediashift and Idea Lab.